The new Gomel hotel offers comfortable rooms of different types, a restaurant, a bar, a billiard room, a beauty salon, a sauna, a conference room, Internet WiFi, and safe parking. Guests can enjoy its atmosphere of home coziness and European luxury. We will do our best to make your stay as comfortable as possible! Estimate true comfort! Stay with us and you will get an excellent opportunity for a pleasant rest and successful business. We offer our guests the best - from stylishly decorated rooms to impeccable service. The hotel has a restaurant, a bar, a billiard room, a beauty salon, a sauna. Also we offer you a well-equipped conference room and a business center. The park hotel conference room accommodates up to 30 people for various corporate events, business meetings, presentations, celebrations. We help our guests - call a taxi, book tickets for trains, theaters and other activities, offer a shuttle service. 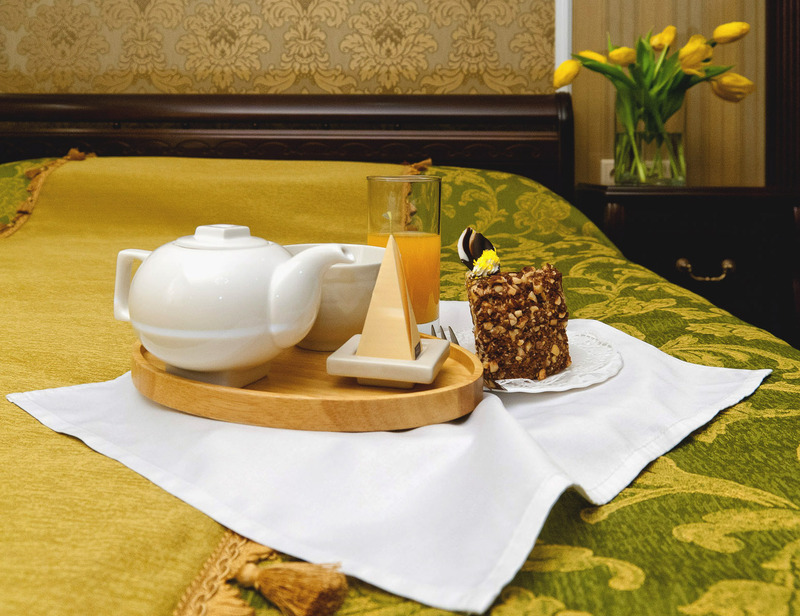 Park-Hotel Zamkovyj is a modern Gomel hotel which offers its guests a high level of service and comfort. So if you choose Park-Hotel Zamkovyj you will get a memorable and enjoyable vacation, guaranteed service and traditional Belarusian hospitality. The original interior design and comfortable rooms make you stay pleasant rest and productive work. We truly reckon that the warm, friendly atmosphere, comfortable rooms, staff hospitality will help you to conduct your business successfully and have a rest in Gomel. We will make sure that you feel at easy, safe and comfortable in our hotel. Because a guest is our greatest treasure, and service quality is a key purpose in the work. We sincerely hope that the hospitality and warmth of our hotel staff will remain with you as the part of the memories about our wonderful city. We will create for you a unique and homely atmosphere. This is the secret of our success. Park-hotel Zamkovyj is your lucky choice! Now we can offer "Business lunch" menu. Waiting for you in the restaurant "Zamkoviy" from Monday till Friday from 12 p.m. till 4 p.m.
We are glad to offer all our guests a special discount of 10% for "Billiards" and special price for "Sauna"! We would like to pay your attention that the Administration of Park-Hotel "Zamkovyj" is not responsible for the information given with other website and different sources.